Supports delay, so that you can schedule a message for minutes or hours after the client comments. Congratulations on picking up Viral Reach! It is the best shot you have at saving your ad budget with its powerful content marketing automation system. Yes, now that you've got organic reach, how about monetizing it? Credi Response Pro will make monetization easier and faster by letting you send your offers, links, and anything else that you want as messages to anyone who comments on your Facebook posts. When someone buys the Elite version, we let them purchase the Pro upgrade for another $67 per year. That’s the amount people have to invest to get access to Credi Response Pro every year. That’s what YOU will have to spend if you try to get it the normal way. Grab this, it is insane. If you lose this opportunity you won’t get it again. 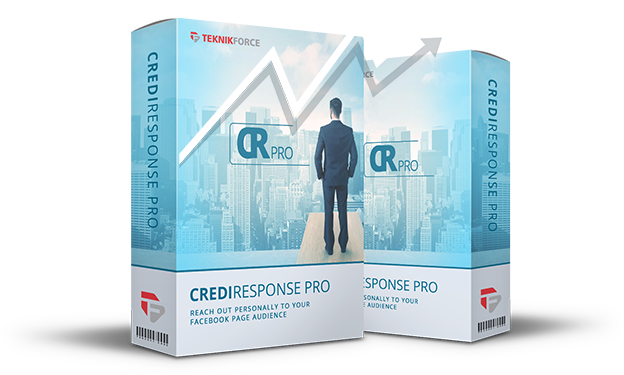 This is the only time you can grab the Lifetime version of Credi Response Pro for this price. Buy Credi Response Pro, and use it for up to 30 days risk-free. If you don’t like what it does for you and your business,just us know within 30 days through a support ticket at https://teknikforce.com/support and we will refund you 100% of the money! No, I don't want to convert my comments. Take me to my purchase.